North Steyne, Manly, 22nd October, 1910. The official guest indicated on the cover; Wm. Henry, Esq. of England, the founder and Chief Secretary Royal Life Saving Society; demonstrates the close connection with the English movement that started in the 1890s. The office bearers and carnival officials include several noted swimmers or surfriders. Cecil Healy, a member of the Manly Club, is a competitor in the Surf Race, listed below. He competed at the 1912 Olympic Games against Duke Kahanamoku and was later a journalist. F. C. (Freddy) Williams, also from the Manly Club, was considered the best of the early surf-shooters. C. D. Paterson, another member of the Manly Club, is said to have imported a surfboard from Hawaii, circa 1908-1912 and would later serve as the Association's President. Lyster Ormsby and Sig Fullwood (with Percy Flynn) are credited as the inventors of the 'first' life saving reel at Bondi circa 1906. Note that the program finishes with a "Shooting the Breakers Exhibition by Members of affiliated Surf Clubs." 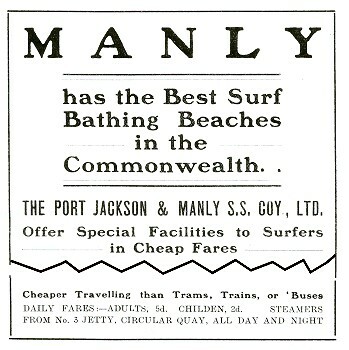 The advertisement for the Circular Quay (Sydney city) to Manly ferry service by the Port Jackson and Manly Steam Ship Company records an early use of the term "surfers", compared to the more common "surf-bathers" or "surf-shooters" of the period. 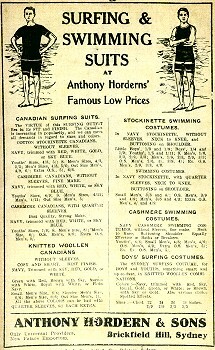 Likewise, the surfing and swimming suits advertisement for Anthony Horden and Son, Brickfield Hill, Sydney on the back cover uses of the term "surfing", compared to the more common "surf-bathing" or "surf-shooting" of the period. L. W. ABEL. E. R. Abigail, Esq. Second Page OFFICIALS FOR CARNIVAL. C. T. TRICKETT, L. C. I. ORMSBY, H. D. SPYER. C. DALY, F. C. WILLIAMS, W. KERR. E. N. V. SHEMWELL, L. HARRIS, C. MARTIN. H. JOHNSON, H. S. FORD, D. CUNNINGHAM. T. TAYLOR, J. B. PYM, S. SNELL, A. B. BURGE. E. M. V. SHEMWELL, L. ABEL, SYD. FULLWOOD. H. PIERCE, P. BURGE, J. JOHNS, P. H. CAMERON. J. .T. K. TAYLOR, H. AUSTIN. A. WATSON, W. A. KELLAM. 1st Prize, £1/1/-, 2nd Prize. 10/6. Professionals Debarred. Members of affiliated Surf Clubs. Block kindly lent by "Town and Country Journal." OFFICIAL WELCOME BY Wm. HENRY, Esq. of England. and Manly Steam Ship Company (adjusted). "surf-bathers" or "surf-shooters" of the period. for Anthony Horden and Son, Brickfield Hill, Sydney. "surf-bathing" or "surf-shooting" of the period. 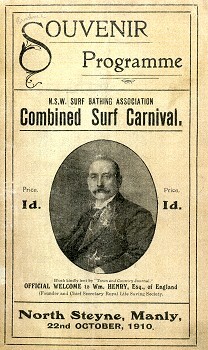 Geoff Cater (2008) : NSWSBA : Combined Carnival Programme, Manly, October 1910.